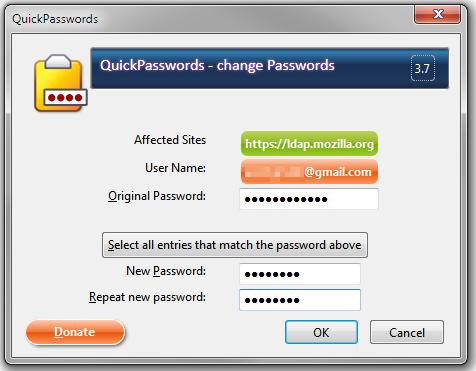 Version 3.7 of QuickPasswords this has a backup / restore feature for logins and passwords. Version 3.6 of QuickPasswords Unified Password (SSO passwords) improvement: it now has a step for selecting affected user names. 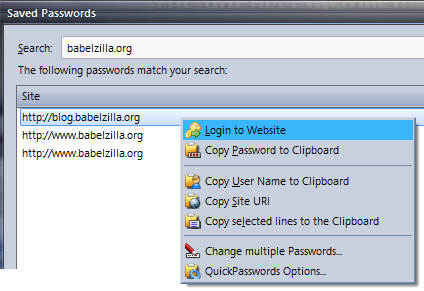 Version 3.2.1 of QuickPasswords Added Icons for supporting the new Firefox skin Australis. Version 2.7 of QuickPasswords can correct login information. New Lock Icon. 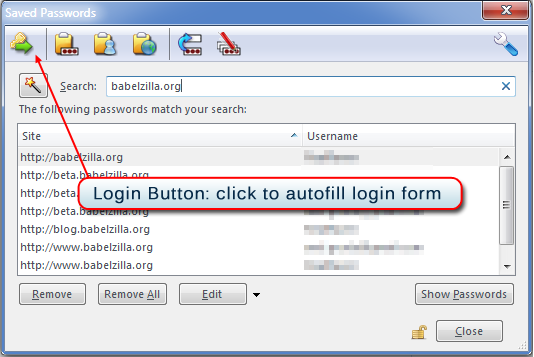 Version 2.5 of QuickPasswords can now fill the login form of a web page for you. 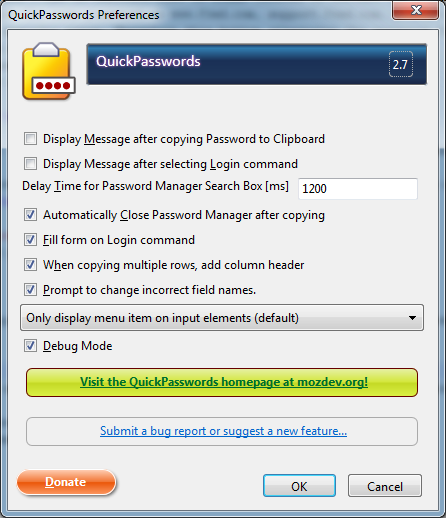 Version 1.6 of QuickPasswords has an additional new method for logging in without using the clipboard. Also, you can now change a common password for multiple sites really easily. also, give Zombiekeys a try! Please, leave some feedback at the mozilla addons page - spread the word so more people start using it! Quickly retrieve your Passwords from Password Manager to the clipboard. No need to display them on screen anymore! Instead of displaying a password, when you need one, use this nifty toolbar button to jump straight to the password manager and copy it to the clipboard. I was always annoyed by the fact that the Password Manage displays not just one Password but a whole list - this extension removes the need to display any password on screen, and gets rid of the inconvenient "typing off screen". Now your passwords can be as complicated and secure as you always wanted! Also, it fills in the domain name so you don't have to look quite so hard. Especially useful for developers who have to work a lot with different login pages. 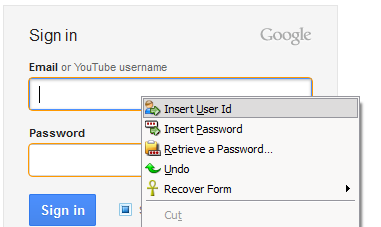 You can insert both User Id and Password with a simple right-click. The clipboard is not used during this operation. For security reasons, the items are removed from the menu as soon as you use them. 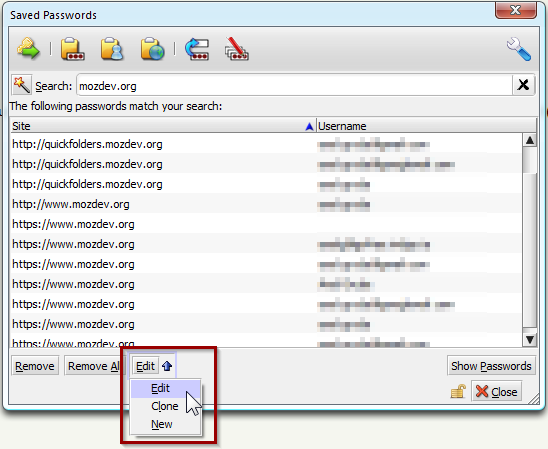 If have not used these for some reason, you can remove them from the context menu using "Cancel QuickPassword Login"
Click the [Copy Password!] button. As the message says, the password is now in your clipboard so you can click the password field and paste (CTRL+V). For streamlined operation, you can configure QuickPasswords to suppress this message as well - go to Tools / Add-Ons and find the entry for QuickPasswords, then click Options. 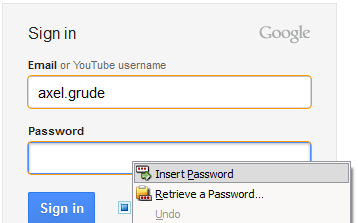 Like the message says, you now have the password in your clipboard - just paste it whereever you need it. Be it on another web form, in a different browser or in a text file. This also removes the need to ever "Show Passwords" on screen. Copy Selected Lines to the Clipboard (useful if you want to export a whole list of logins / passwords) - especially handy for developers and testers. As for the last option you can also include a header line for convenient use in spread sheets. You can now change the password to one web site or multiple sites of a Single Signon Domain (provided they have matching passwords). 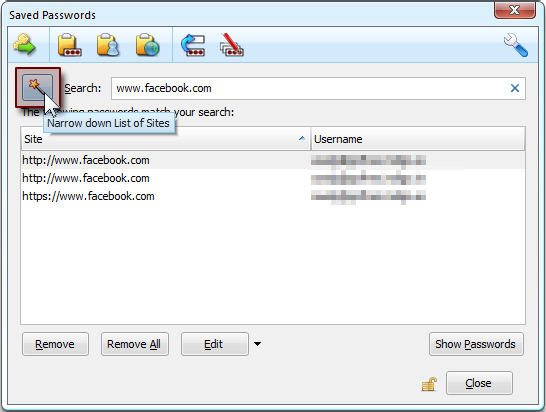 Simply use the magic wand in the password manager first to display all sites of your domain (e.g. google.com). Then press the [change multiple passwords] button. The "old password" field will be pre-filled correctly. Now click on [Select all entries that match]. This will highlight all items that satisfy the filter in the Password Manager (in this example, all ending with google.com) AND have the same password. Enter a new one below. Now you can change passwords for all these entries by clicking on [Ok]! in the next step, all affected sites are displayed (top list). 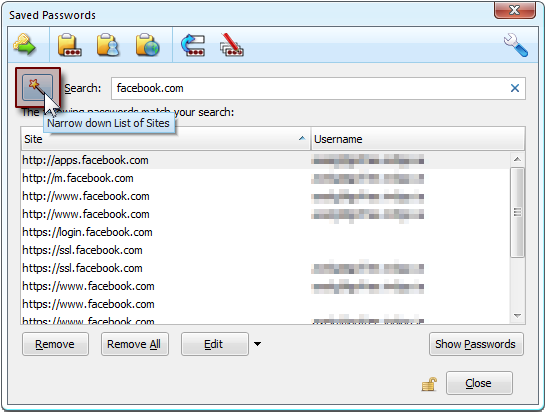 QuickPasswords will also extract all user names in case you have variations within the SSO domain, such as "user", "domain\user", "domain\User". You simply select the user names from the bottom list so only those are affected. 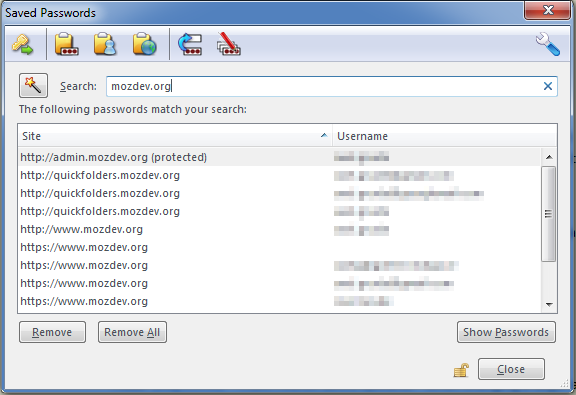 The very clever Saved Password Editor Extension is highly recommended and can be used in conjunction with the QuickPasswords extension. It basically allows to edit existing password (and the related form information), but also add new ones or clone existing ones. Use this to backup / restore passwords to file. Could be used as a rescue method if Sync malfunctions. This is protected with Firefox's master password. I don't want QuickPasswords to be the one simple way to steal your friend's passwords, so the backup / restore features are protected with the master password. Secondly, we cannot have files full of unencrypted passwords on some local storage. It's just not safe at all. So by default, QuickPasswords uses Firefox built in keystore which is a unique personalized encryption platform generated when you create a new Firefox profile or install Firefox for the first time. This also means that you won't be able to restore the passwords on another Firefox / Profile unless you have a copy of the same keystore. Same is stored in a file called key3.db and should be backed up somewhere to read the passwords again. If you loose or break this file you will also simply not be able to read your passwords on your Firefox anymore. As long as you use the same Firefox on the same Computer this won't present a problem unless there is a file corruption. To transfer to a different machine simply copy the relevant profile folder or at least key3.db. Modified passwords: Restore will only change a password if it wasn't changed in the meantime. This way you won't accidentally overwrite a password you may have changed online into an older version. However, if this is what you actually want to do with a particular login, [maybe because a password change online didn't propagate into the web] you can simply delete that one manually before doing the restore. File handling: you can store your files wherever you like, but I would still recommend not putting them on a public folder or shared drive, unless you have set up correct access permissions. Better safe than sorry! Entering European languages (which include diacritics (accented characters, diaeresis, umlauts, etc. ), ligatures, the Euro sign, etc.) into Mozilla applications using a non-native keyboards doesn't have to be a pain any more! 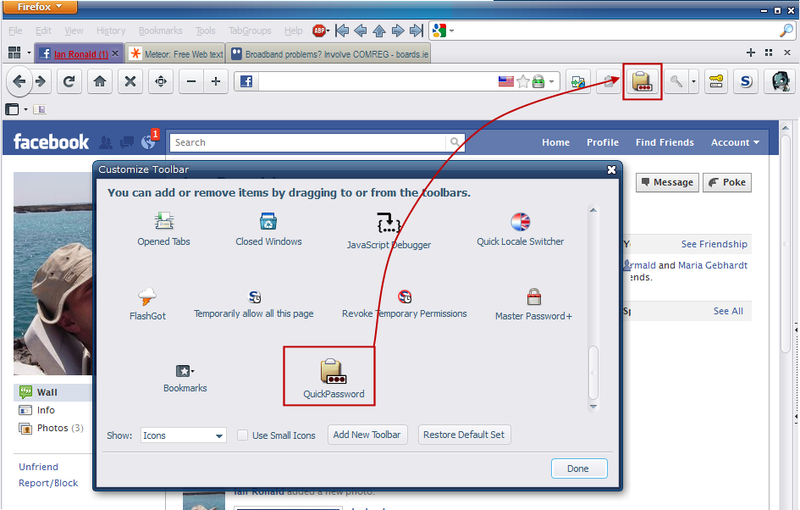 QuickFolders (Thunderbird / Postbox) takes the pain out of working with many mail folders; has currently 22,000 daily users and the top rated message reading extensions. quickFilters (Thunderbird / Postbox) Quickly generate mail filters on the fly, by dragging and dropping mails and analyzing their attributes. SmartTemplate4 (Thunderbird / Postbox) SmartTemplate4 offers an easy way to customize Thunderbirds default quote header by using templates.